We are thrilled that the project “On the tracks of the Regional Products” or “Regional versorgt” is continuing this year. 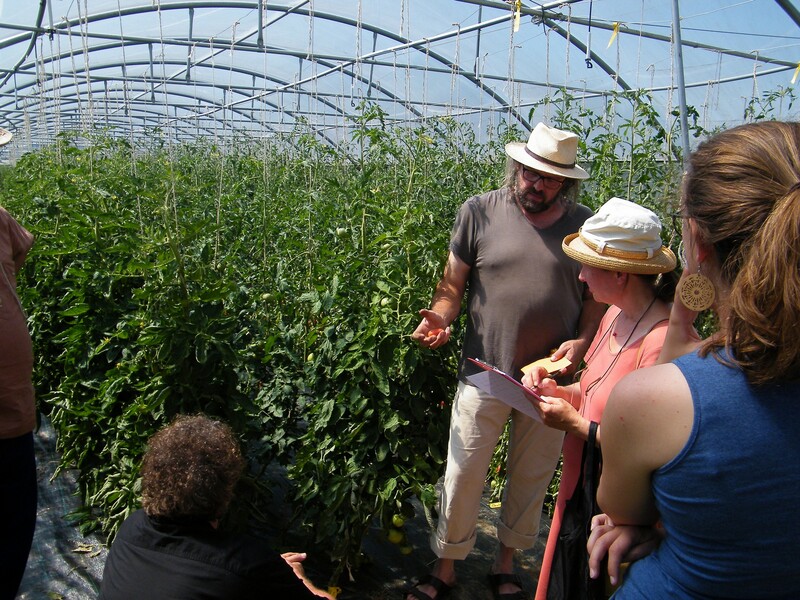 The project consists of four daily excursions to the places in Freiburg and its surrounding areas where our food is produced. The aim of the project is to understand the strictly connected ecological, socio-cultural and economical consequences related to our food choices. We experience the “journey” of the food, from its origins to the market stands, and have the opportunity to meet the food producers and the relevant actors. At the end of the day we cook (using the products that we got from the excursions) and dine together and take a moment to reflect on the experiences of the day. 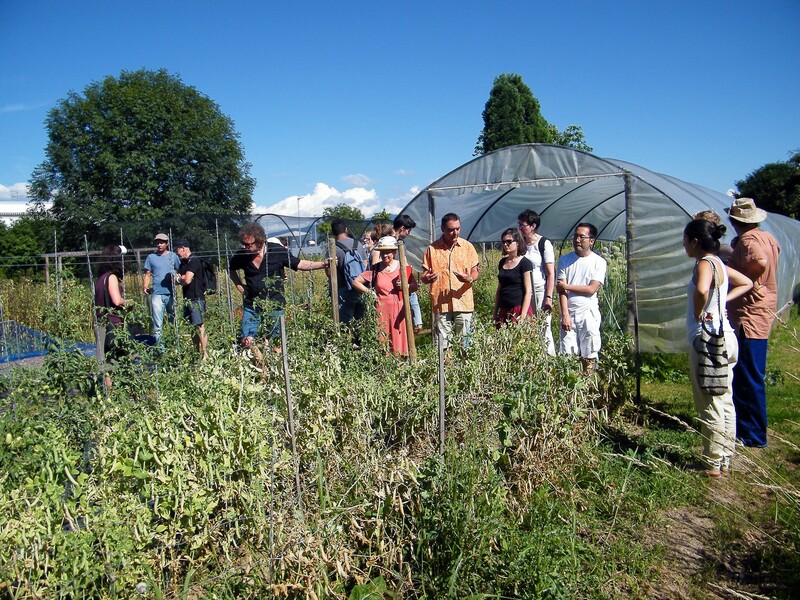 In collaboration with “Die Agronauten” and Kantine Vauban, aiforia organises the programme of the 4 excursions and guides the tours. 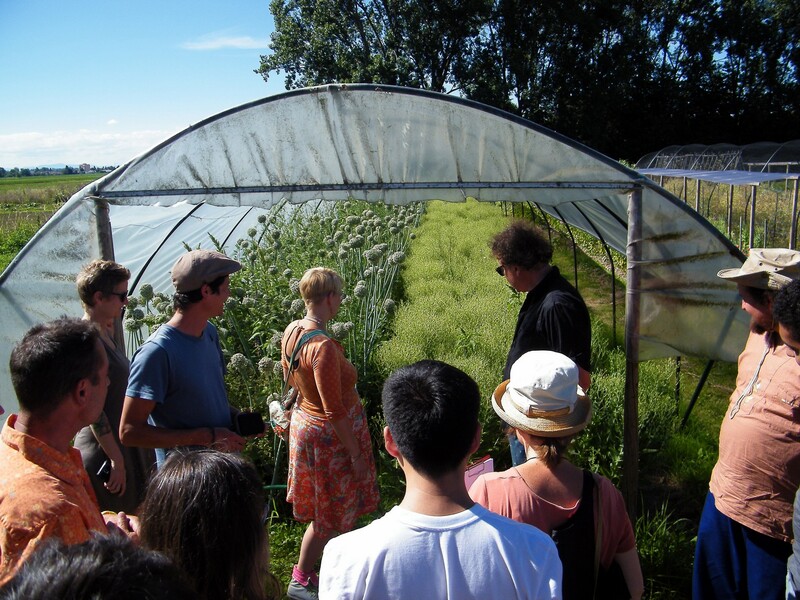 On Sunday, July 17, we visited organic food producer Klosterhof in Gundelfingen where Michael Müller, the founder of Klosterhof, gave us a fascinating insight to organic vegetable farming (e.g. 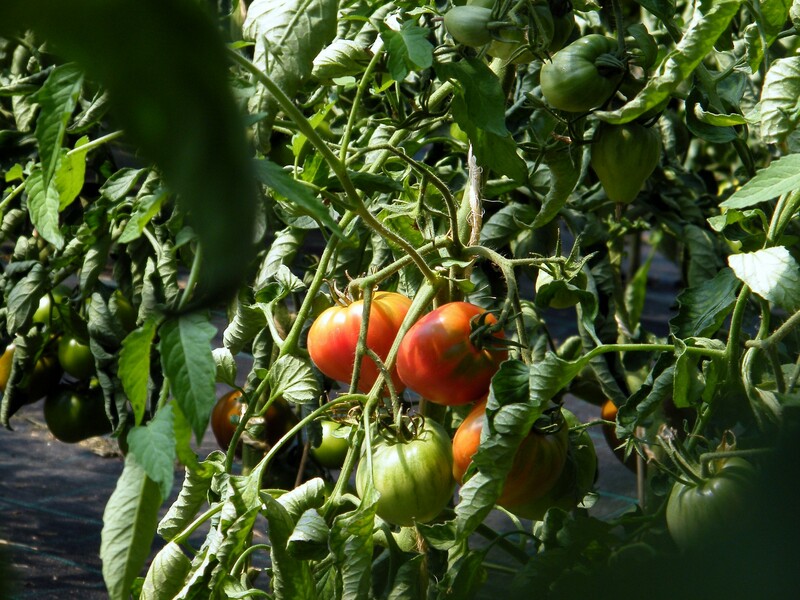 using biological systems instead of pesticides), and introduced us several tomato varieties, including the beef tomato (Ochsenherz), Berner Rose and Black Krim (Schwarze von der Krim). Even global topics got covered among the regional issues, such as the expansion of large corporations in the seedlings production. 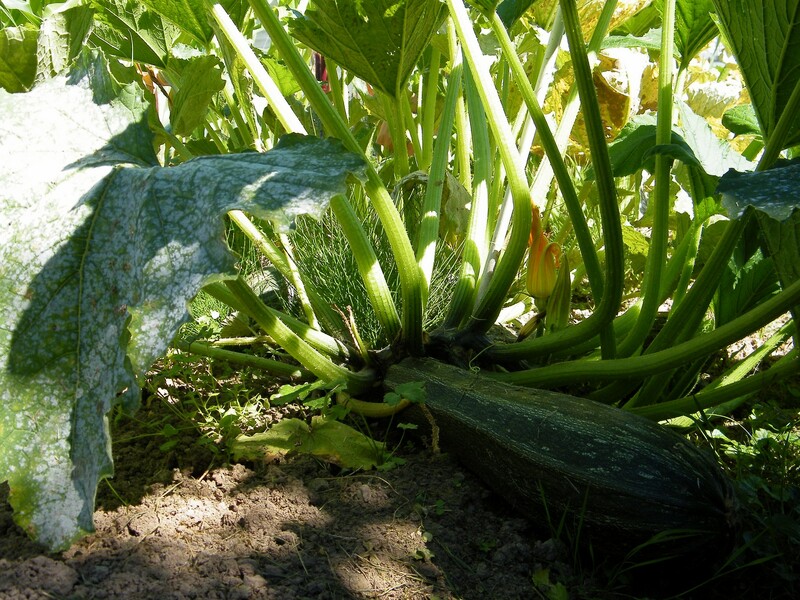 We saw how different the vegetable plants look like if you do not harvest them but let them grow for seeds – huge zucchinis, salads that were really tall plants with tiny yellow flowers, and onions with ball shaped flowers of top. It was wonderful to see that you can be a successful organic farmer, do it in a relatively small area of land, and with modern merchandising methods – by selling the seeds on the internet and by mail order. The excursion finished in the Vauban Kantine, where we helped the chef Solveig Hansen in the cooking process, ate the delicious meal and chatted about the day. 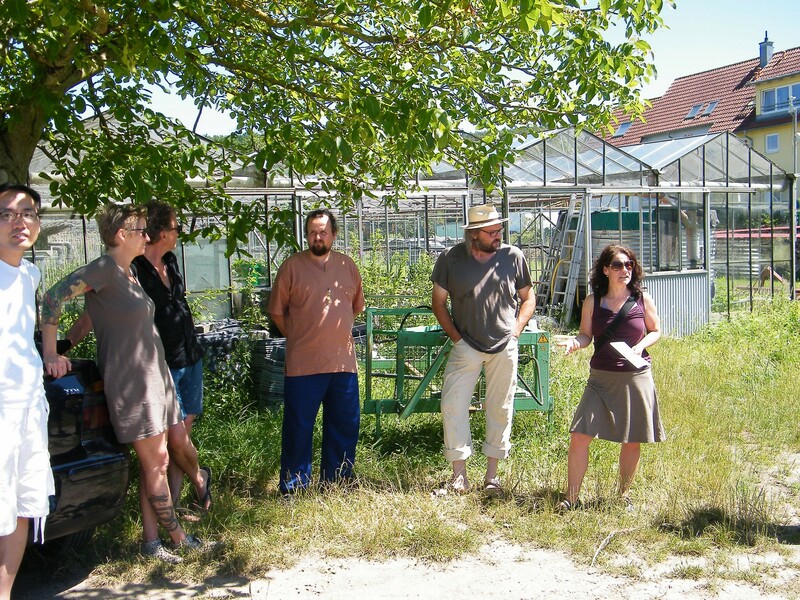 On Monday, July 18, the tour started in Obstparadies (Fruit paradise) in Staufen. The founder, Johannes Geng, took us to the 10ha orchard where 700 tall-growing trees and 1600 medium sized trees truly visualize the name of the enterprise – fruit paradise. In addition, there were also 200 old Apple cultivars and several exotic fruits, such as paw paw (Indianerbanane), persimmon (Kakis) nashi pear (Naschi). It was fascinating to learn that even though 85% of the citizens prefer fruits that were not sprayed with insecticides, there are less than 1% of fruits which are not sprayed! Also, only 18% of apples and strawberries in our supermarkets come from Germany. On the positive side, we got the chance taste the delicious fruits of the Obstparadies and we hope very much that soon we can buy the produce in Freiburg shops. Back in the Kantine Vauban, we learn that in light of the AgriKultur-Week chef Solveig Hansen has challenged herself to cook, using only regional products. While she admits, that at times it is challenging – especially regarding some spices, e.g. trying to find substitutes for pepper – she once again excels in her talents and we are enjoying her culinary perfection. Yum! The next stop in the afternoon was the Lindenbrunnenhof in Forchheim am Kaiserstuhl that is famous for their potato varieties. Indeed, Otmar Binder and his family are growing over 40 different types of potatoes, but also over 20 types of tomatoes (plus other veggies, fruits and herbs) – which of course are all ecologically grown. What is also charming to learn, is that their customers are not just passive buyers, but have given many recommendations and wishes for specific varieties and even donated such seeds. Once, a package arrived with seeds from Nigeria (although apart from the pilot test they do not grow it due to climate differences). The Family Binder also has soybean fields (see the photo below) and grain crops (for a quality bread). Well, that was two days full of enchanting knowledge and delicious tastings. In case you missed the events in July do not despair – there will be two more day excursions in September (visiting an oil mill and a forest pig farm, amongst others). For updates, keep an eye on our Facebook page or email Andrea Philipp.